This is the capital's "strategic cycle network". 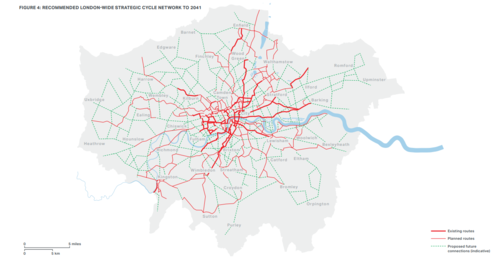 The thick red lines are the existing routes - the Cycling Superhighways and Quietways, that have been spreading across the capital over the last few years. The thin red lines are those that are currently planned, and the green dotted lines are possible later connections. If all this is delivered, the strategy says, 70 per cent of Londoners would live within 400m of a cycle route - a distance you can cycle in a couple of minutes. I remain at least slightly sceptical. For one thing, the implementation of such routes is dependent on the enthusiastic cooperation of the boroughs, which control the capital's local roads. Note the way those thick red lines just stop as you pass from Westminster to Kensington & Chelsea, a borough not known for its enthusiasm for cyclists. The other source of my scepticism is that TfL has always been quite cagey about what the different grades of cycle route mean. Some of the cycling superhighways are proper segregated routes - but others, like CS1, share backstreets with motor vehicles. It's not clear how that really differs from a Quietway - or, indeed, how Quietways differ from the long-standing but largely forgotten London Cycle Network. So, yes, a proper city-wide cycling network of this sort would be lovely. But I am not entirely convinced we are going to get one - even by 2041.